Charles Broadwell is the publisher of The Fayetteville Observer and the president of Fayetteville Publishing Co. He is the 4th generation to lead this family-owned newspaper. Broadwell is a Fayetteville native and a Phi Beta Kappa graduate of the University of North Carolina at Chapel Hill. He also has completed fellowship programs at Northwestern University and at the Poynter Institute in St. Petersburg, Fla. Broadwell began his journalism career at age 16 working in the Observer’s sports department. He served as the newspaper’s editor for more than 10 years and has been the publisher since 2000. Broadwell is the author of “Our Century,” a book that was compiled from his series of oral-history interviews for the Observer in 1999. 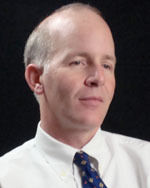 Among his professional affiliations, he is serving as the president for 2010-11 of the North Carolina Press Association. He serves on the board of the Press Association and the North Carolina Press Foundation (past president). The power and purpose of journalism was clarified for Charles Broadwell after he undertook a year-long series of oral histories for his newspaper in 1999-2000. “It was year like no other for me,” says Broadwell.